As I continue my journey toward Salesforce certification, I’ve found myself using a variety of resources to gain the knowledge and experience I need to pass the Salesforce Certified Administrator exam. If you Google the phrases “Salesforce certification” or “Salesforce training,” you will be inundated by results ranging from online study materials to Salesforce Help site links to live classroom courses. There is no end to the resources at your disposal, and it can be difficult to pick and choose when you have so many options available to you. Salesforce, obviously having recognized the sheer volume of material available, created Salesforce Trailhead as a guided, hands-on learning path for administrators, developers, and technical architects. Aptly named, Trailhead allows you to select a path based on the type of training you’re interested in pursuing and provides you with modules that range from basic administrator training to advanced developer topics. The “trails” are self-paced and interactive, so you can learn about certain topics and functions and then actually apply them to a real Salesforce sandbox or developer org. Each Salesforce Trailhead module is arranged in a hierarchical way, so you can progress through it in a logical and linear manner. The sequence encourages you to build up–and even test–a solid knowledge base in earlier units, then progress through more advanced levels. Salesforce Trailhead lets you choose your level and move at a pace that works for you. One aspect of Trailhead that I’ve particularly enjoyed is the assessment at the end of each unit. Here you can perform a series of tasks as a way to test your knowledge on that topic and then verify that you’ve performed the actions in a way that meets the requirements of the assessment. By connecting to a Salesforce org directly, the Trailhead module checks your actions on the spot and notifies you on whether or not you’ve completed the task correctly. You even get points for each correct assessment, which adds an element of gamification that can be rewarding. Badges are awarded when you complete a full trailhead, so you can share updates of your newly acquired expertise on social media platforms. Badges are a great way to feel like you’ve accomplished something and have made progress in certain subjects. 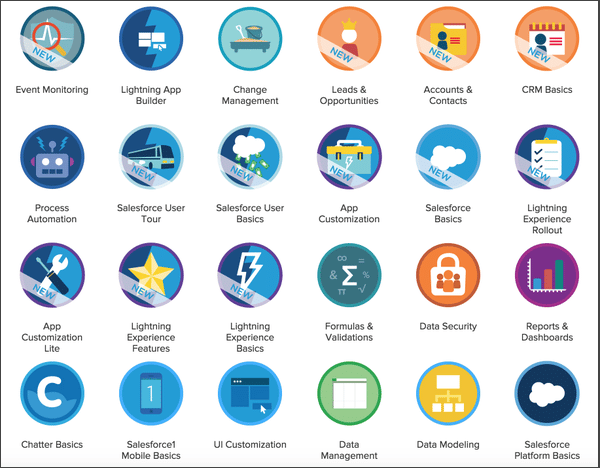 In Salesforce Trailhead, you choose the knowledge areas to pursue–then earn badges for mastering each topic. I’ve used other resources to study for the exam and have found some of them to be engaging and helpful. But, in the end, the Salesforce Trailhead model seems to be the most compelling, and it keeps me coming back for more. I’ve already picked up a lot of useful skills and have found that the ability to check my knowledge through assessments before proceeding on to the next topic is extremely useful. Are you on the path to a new Salesforce certification? If so, have you given Salesforce Trailhead a try yet? What other resources have you found helpful in acquiring more Salesforce knowledge and expertise? 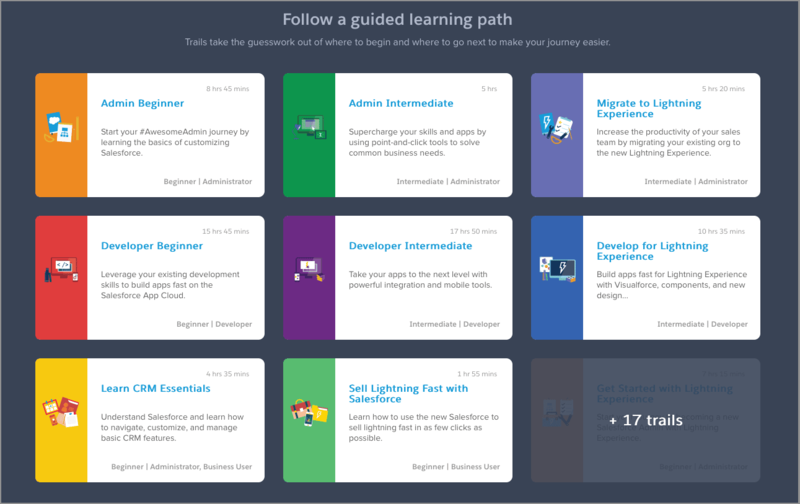 For more information on Trailhead, check out this blog post from Salesforce: Trailhead: A New Approach to Learning Salesforce.